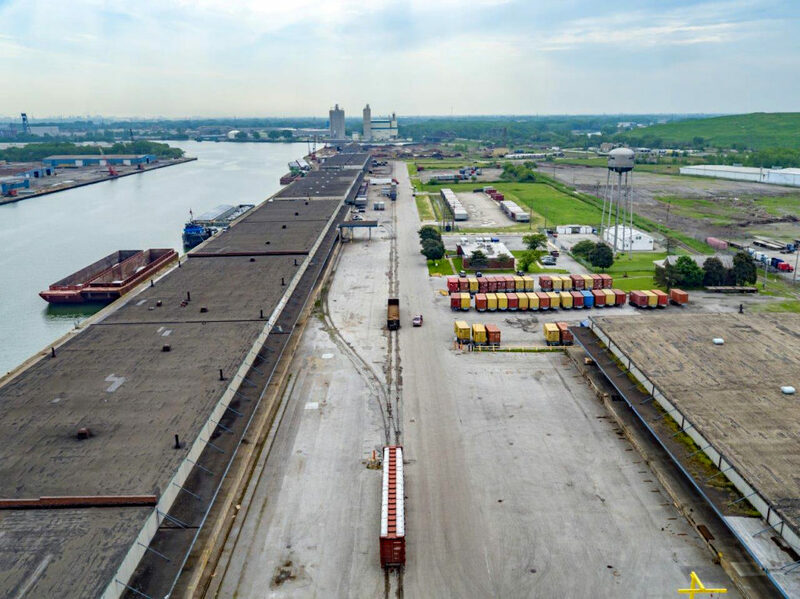 For the first time since 1981, the Illinois International Port District (IIPD) is undertaking extensive repairs and construction in the southernmost part of its 1500-acre property on the Southeast Side. Infrastructural updates will help the Port “attract more tenants to come here, more business to come here, more jobs to come into this area,” executive director Clayton Harris III said at the IIPD’s first-ever annual “State of the Port” on August 23. Over a spread of spring rolls and meatballs in the IIPD’s golf course restaurant, Harris told the fifty people in attendance that the district was moving forward with plans to repave freight roads, repair the crumbling dockwalls along the Calumet River, and repurpose the old, empty silos that tower over Lake Calumet. 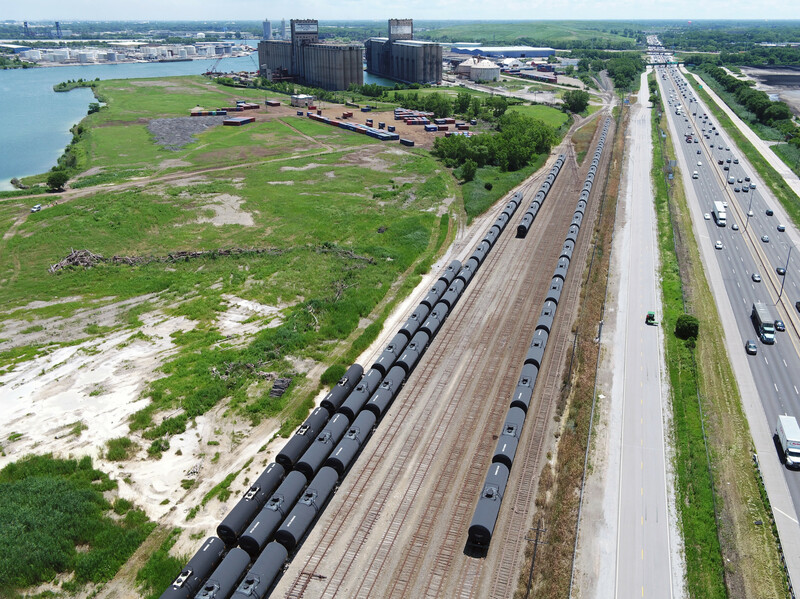 It’s part of a larger ongoing planning process led by the Chicago Metropolitan Agency for Planning, along with the Army Corps of Engineers, the Nature Conservancy, and other organizations, to create a plan for the port’s future as a site of transportation logistics and recreation. It’s the first strategic plan produced by or for the port since the early 1980s. The first project to break ground will be the rehabilitation of Butler Drive at 130th Street, which houses the district’s transit shed, the building where incoming or outgoing cargo is stored on a short-term basis. Several grants from the Illinois Department of Transportation and Cook County, as well as $3.5 million in TIF funding, over $17 million, will allow the district to begin construction in early 2019. The overhaul is part of Harris’s dizzyingly large plan to revitalize the Port, which in the last several decades has seen its commercial activity dwindle as its debt increases. The Port of Chicago is the country’s largest inland port. With nineteen million tons of cargo passing through annually—mostly building materials and commodities like sugar, salt, and bulk liquids—it remains the most active port within the Great Lakes region. But the Illinois International Port District, the governmental entity that oversees port operations, has faced criticism in recent years for its lack of accountability and failure to prioritize commercial business. In 2008, after a review of the IIPD’s available financial and governing documents, the Civic Federation concluded that the IIPD was “seriously lacking in governmental transparency and openness to the public.” The group also expressed concern that IIPD was abusing its tax-exempt status by investing more in its golf course than the port itself, which had not undergone infrastructural updates since 1981. A later audit conducted by the Illinois Auditor General found that the port had not updated its policies governing rent and port usage since 1983, and that its board—which is appointed by the mayor and governor—had no long-term strategic plan despite a $1.2 million operating loss between 2010 and 2011, during the period of the audit. At the State of the Port, Harris did not address how the IIPD was planning to address its deep-seated accountability problems—but noted that financial statements were available online, and that requests for proposal and bids for future projects would be accessible on the port’s website. Instead, he talked about the IIPD’s vision for the port as a site of industry and recreation. One of the port’s priorities is going green. This will first entail switching over to the solar grid. Installing solar panels on the roofs of both transit sheds would generate twice or three times the energy needed for the port to power itself, Harris said. The port would also consider selling the extra energy to nearby communities, many of which have been hit with skyrocketing utilities bills, though Harris said he was not yet sure about the details. Solar is the first step, Harris said, but they are also already scoping out locations for wind turbines—three at Lake Calumet, and another two or three at Iroquois Landing at the mouth of the Calumet River—and thinking about thermal energy. Much of the planning process involving CMAP won’t be completed until the end of 2018. In the meantime, Harris says, he is currently talking with directors of other major ports to improve communications and best practices. Harris also said he was considering transforming the now-empty grain silos, which caught fire in 2012, and which still feature the faded names of former governor Rod Blagojevich and former mayor Richard M. Daley in paint on their western-facing sides, into a site for urban agricultural businesses. But the more immediate projects at hand are a three- or four-star hotel and a boathouse, to be built on the western side of the district’s property, near the site of the golf course. Harris said requests for proposals for the hotel and boathouse would be ready by November of this year, and that there would be a three-month turnaround period before plans were finalized. Once those projects are completed, residents can expect to see increased programming in and around Lake Calumet, which the district uses as one of its two barge-docking areas. Harris suggested that they might bring paddle boats for use in the lake, as well as open up the southernmost part of the lake for local crewing practices. In addition, the District is working with the Active Transportation Alliance to build a bike path across port property, connecting Pullman to the Big Marsh bike park to the west—something that residents and bike advocates have organized around for several years. But some residents were skeptical. Pullman resident and organizer Tom Shepherd, while excited about many of the changes coming to the district, was unconvinced by Harris’s emphasis on community. Shepherd, who has been part of local organization Southeast Environmental Task Force (SETF) for nearly two decades, said that SETF has been presenting ideas for increased recreational opportunities to the district board for years—and now they’re being left out of the planning process. Harris laughed, and the rest of the room joined in. “Well, I was thinking probably sooner than a port wine might be some port beer,” he said. Emeline Posner is the Weekly’s food & land editor and a freelance writer. She last wrote a dispatch from a Tom Shepherd-led boat tour sponsored by the Metropolitan Water Reclamation District of the Calumet River and Lake Calumet.